AMSTERDAM — The Saugerties Stallions made the trip to Amsterdam again Tuesday night with a Division lead at stake as they played the Mohawks in a modified doubleheader at Shuttleworth Park. With both teams sharing 17-12 records and tied for the lead in the East Division of the PGCBL, it shaped up to be a battle for both squads. Prior to Tuesday’s scheduled game, the Stallions and the Mohawks resumed play from the game that was suspended on June 24. The Mohawks rallied late in that game to win 11-4. The game resumed in the bottom of the fourth inning with the Mohawks leading 4-0. Andrew Taft and Jordan Kozicky scored for Saugerties in the seventh inning and then again in the eighth to tie the game at four. However, in the bottom of the eighth, Amsterdam responded with a display of offensive power. 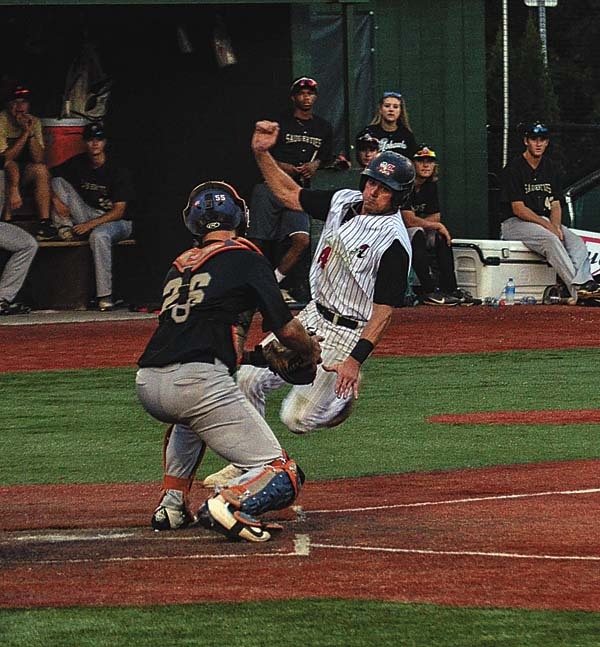 The Mohawks scored seven runs on five hits including a lead-off home run from Shane Muntz. Elvis Peralta’s steal attempt forced the Stallions to throw the ball away allowing Justin Foscue and Peralta to score. To seal the win, Amsterdam got insurance runs from Mike Antico, Jake Hammon, Joe Genord and Cole Barr to put the game out of reach. The nightcap took on a similar look although it ended much differently with the Stallions coming back to win 5- 4. Amsterdam took an early lead scoring one run in the second when Tanner Allen hit an RBI single up the middle bringing Genord in from second base for the score. The Mohawks added two more runs in the fourth inning. Foscue drove Genord in with a bloop single to right field and then Hammon out ran a double play that allowed Muntz to score, giving the Mohawks a -0 lead. Saugerties scored two runs in the fifth and one in the sixth to tie the game. In the fifth inning Cameron Comer scored from third base on a wild pitch and then Dillon Lifrieri hit a single up the middle that drove in Kozicky. In the sixth inning, Kozicky hit a double to center field that scored James Gargano to tie the game at three. The second game was scheduled for seven innings but with the score tied after seven, extras were needed. In the top of the eighth, with two outs, Comer took the first pitch that he saw and launched it over the fence for a solo home run, giving the Stallions a 4-3 lead. In the bottom half of the inning, Genord led off by drawing a walk and was replaced on first base by Dale Stanavich. Two batters later, Muntz hit a double to center field that scored Stanavich and tied the game again at 4-4. In the ninth inning, Tyler Kelder got on base and then stole second to put a runner in scoring position. Lifrieri hit a deep blast to center that bounced over the fence for a ground rule double and scoring Kelder to put the Stallions back on top. The Stallions were able to shut down the Mohawks in the bottom of the ninth and held on for the 5-4 win. The split gives both teams an 18-13 record and they remain tied for the lead in the East. Amsterdam travels to Saugerties today for another match-up with the Stallions that will determine the outright leader in the division. Clayton, Hinkle (8) and Comer; Barr, Kerr (4), Espinal (5), DeBrino (9) and Muntz.